This American heavy/thrash metal band was formed in 1986 in California with singer Mike Torres (who would soon leave to Abattoir) and recorded an EP called Torture Knows No Boundary in the same year which was issued by Metal Blade. The EP featured Mendez on vocals. The singer was soon replaced. 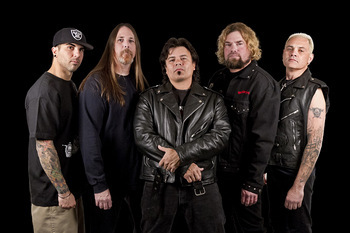 The band fell apart after the full-length with Howe defecting to Metal Church and other members working with former Metal Church singer David Wayne in the band Reverend. Lost and Found Records re-released Breaking Point in 2009. Heretic reformed and was writing music fin 2011 or a new album that was due in 2012. The band's line-up was original members Julian Mendez on vocals, Brian Korban on guitar and Dennis O'Hara on bass. The new members were ex-Hirax guitarist Glenn Rogers and Federico Dupay on drums. In 2012, Metal On Metal Records signed the reformed Heretic. An Album was due. Korban and Mendez were present from the band’s early days.